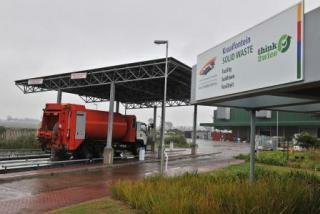 Transforming waste into a useful resource was the key focus in the design of the ultra-modern, award-winning Kraaifontein Waste Management Facility. This is the first integrated recycling facility in South Africa – it sorts 100 tonnes of dry recyclables a day – and includes a public drop-off site and facilities to sort dry waste and chip green waste. The aim is to divert as much waste as possible from landfill sites and to make recycling economically viable.